Just west of Museum Row in South Kensington, a little bit south of the shops along Kensington High Street and a touch north of Fulham Road in Chelsea, there’s a charming little neighbourhood called Earl’s Court. It’s a tad off the beaten path for tourists and all the more lovely precisely because of that fact. 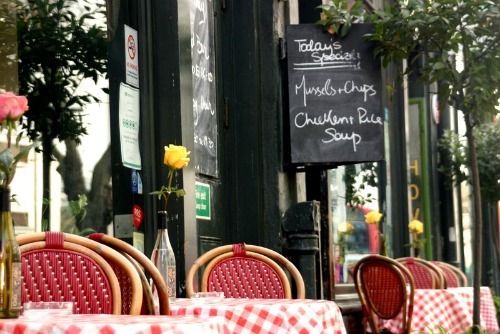 Here you’ll find everything you know and love about Kensington and Chelsea, including rows of elegant Victorian homes, pretty garden squares and peaceful residential neighbourhoods near great restaurants and London shopping spots. However, there’s one thing that you’ll only find in Earl’s Court … the Troubadour! 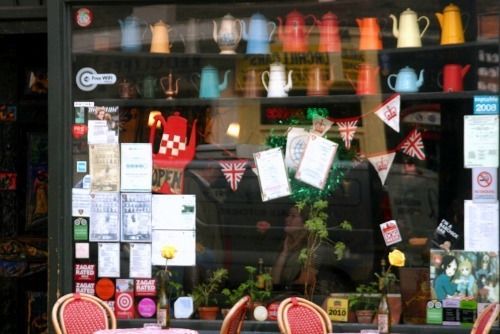 Earl’s Court most popular café is one of the last of the London’s great coffee houses founded in the 1950s. 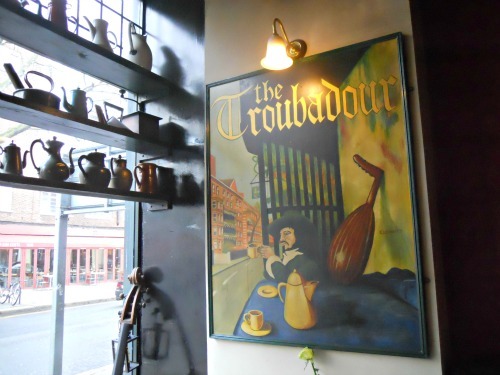 As a café, restaurant and music venue, the Troubadour was right smack in the centre of the Swingin’ 60s scene in London. Even though it remains at the heart of London’s music scene, it still oozes that vintage charm of days gone by. And oh what days they were! Through these doors walked such legendary performers as Bob Dylan and Jimi Hendrix. In more recent times, Troubadour also had the honour of hosting Adele’s first gig. The colourful windows at the Troubadour – impossible to miss! 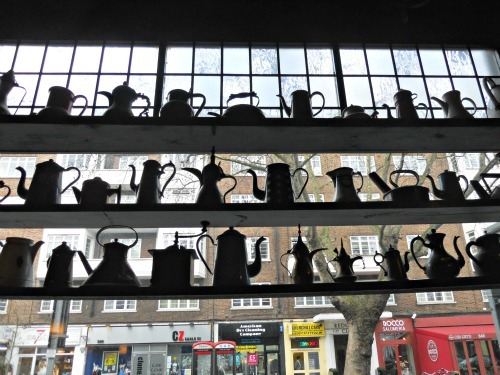 As you walk down Old Brompton Road, it’s easy to spot the Troubadour with its colorful rows of teapots lining the windows. Inside, the decor is what might happen if the owner of a nostalgia shop decided to move in with a bohemian musician – vintage bits and bobs line the shelves and the walls are covered with memorabilia, instruments, records. Everything but the kitchen sink. (It might be there and we just missed it …) It’s charming and utterly refreshing in its uniqueness. 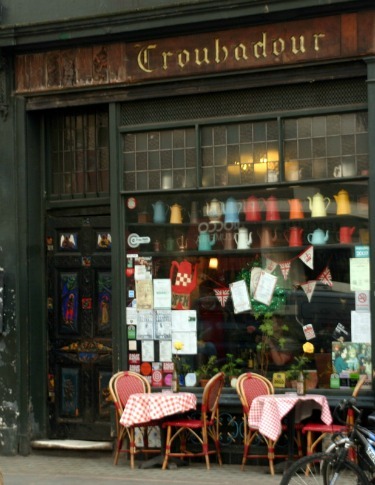 The Troubadour is a café and restaurant with an extensive menu for breakfast, brunch, lunch and dinner. Locals stop in for a coffee and comfortable spot to catch up with friends or to tuck into a nice bowl of soup or the daily specials. When I stopped in recently I enjoyed lunch next to a table of young mothers who were talking about their kid’s schools, shopping and life over a cup of coffee. That’s the Troubadour … from Bob Dylan to neighborhood moms … all naturally coming together in one setting. The musical heritage of the Troubadour is everywhere you look. 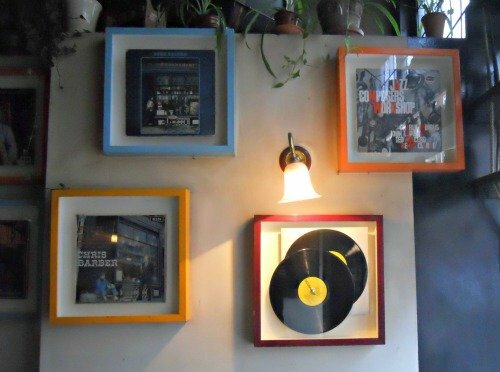 The walls are covered with memorabilia that includes photos, newspaper clippings, framed records and even a guitar. And it’s not just the past, The Club at the Troubadour hosts concerts most evenings during the week. 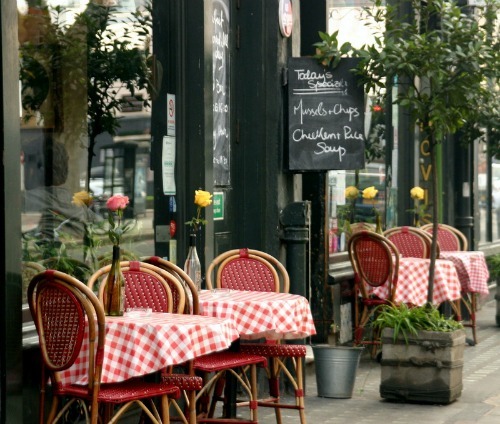 It’s located just downstairs from the restaurant and café, and if you head down there to take a look you’ll pass the entrance to the little garden dining spot out back that’s super popular in the summer. Just next door you’ll find Troubadour Wines, which is an excellent wine shop that also offers wine tastings. 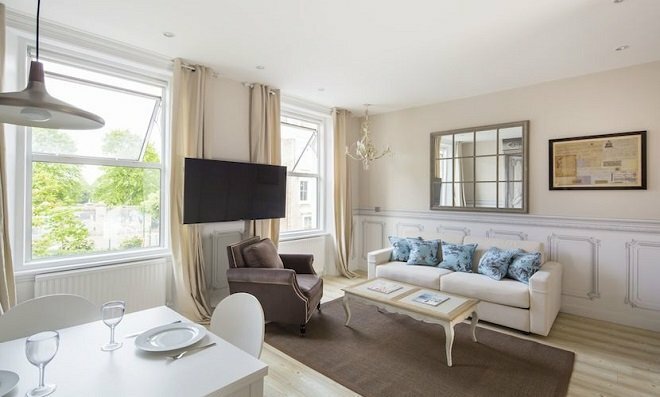 Guests staying at our lovely Churchill vacation rental just a few blocks away can enjoy popping over to the wine store for a bottle of wine with dinner or stop by the café for brunch in the mornings before heading out for a day sightseeing in London. Oh so charming Chelsea in London! Posted on Thursday, February 21st, 2013 at 3:49 pm in Food & Drink. You can follow any responses to this entry through the RSS 2.0 feed. You can leave a response, or trackback from your own site.